doeTAAL is an officially recognized language school in Utrecht. The teacher at doeTAAL is Heleen Arnold, who is certified to teach Dutch as a second language for all levels. She is very experienced in this. doeTAAL aims for students that can learn autonomously with little supervision. This is why many higher educated expats follow language courses at doeTAAL. The teacher decides, after a (free) intake, which group is most suitable for the student. At doeTAAL we work with small intensive groups of 4 to 5 students. Each group has 2 hours of class per week. This time is used for lots of practice to improve speaking and to explain new materials. Pieces of audio, texts from Dutch current affairs, songs and movies are regularly used during class. A nice method to train the skill of reading and listening! Outside of class, students are expected to spend a minimum of 4 hours per week on homework. The homework consists of exercises in listening, speaking and grammar. These exercises are taken from the teaching method and from other materials selected by the teacher. Students can send an email or WhatsApp with questions to the teacher every working day. Feedback on writing exercises is also given by email. doeTAAL also offers private one-on-one lessons, for an extra fee. Of course, these lessons adress specific learning concerns of you as a student, such as speaking or writing. doeTAAL can also help you with the editiorial of a dissertation or scientific articles. 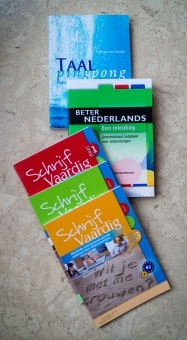 We are flexible in planning these lessons, allowing you to learn Dutch at a time that suits you. Private lessons can also be taken via a Skype conversation, if a student wishes to. At doeTAAL we do not work with a fixed curriculum, or set end of a course, as you are never finished with learning a language! We can help you to prepare for certain exams, such as the integration exam or the state exam at level I or II. A language course at doeTAAL costs € 20 per week. This includes the class and all supervision by email and WhatsApp. It is also possible to participate in evening classes, for an additional € 10 per week. If you, as a student are not able to participate in class, you will receive a report of the class which includes information about the homework. A fee of € 5 is charged for this service for every missed class. At the end of each month doeTAAL will send an invoice, which can be paid by bank transfer. One-on-one lessons cost € 40 per hour. Our experience tells us that lessons of one hour to an hour and a half have the best result. Contact doeTAAL directly by using the contact page!